Okay, so picture this... dark clouds overhead, it's Halloween night... and Paper Smooches Bitty Bungalows are EVERYWHERE! Bwahahahahaaaa! Okay, you're right. Bitty Bungalows are adorable not scary, but I LOVE THEM! And I love Halloween. And I loved using them for this Halloween card. K? K. So there. 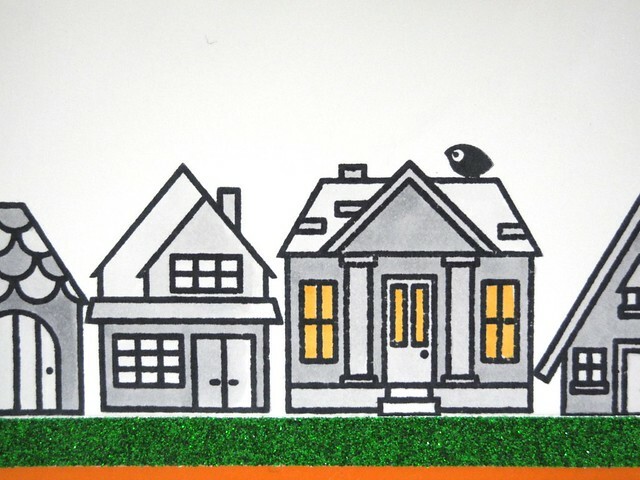 I stamped and colored these adorable houses in all greys to play with the spooky Halloween neighborhood feel. I then die cut the clouds (which are actually the CAS-ual Fridays Bubble Labels) from wood veneer and inked them to make them look dark and stormy (and adorable, yes, we've covered that... LOL!). 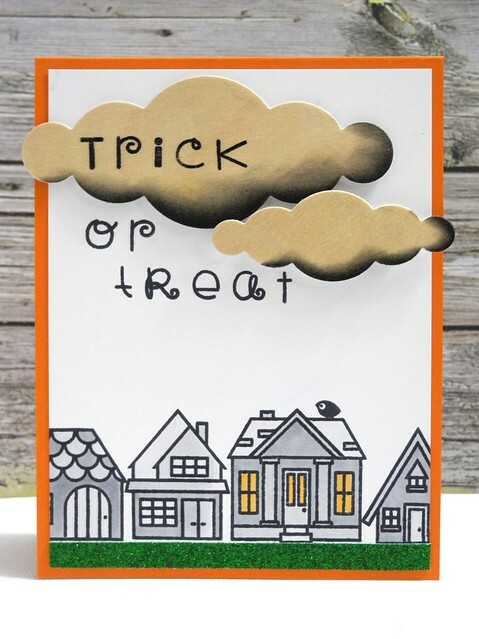 This was a fun card to create and I love that it doesn't even use Halloween stamps. And that bird... that bird SO makes me laugh for some reason. I have no idea why, but every time I see him sitting there on the house he just cracks me up, so... basically he wins. It is going to be a very busy week on the blog this week! I hope you are ready and excited to stick around! Too cute!!! Love your clouds! Aaaaaaadorable!!!! Love that bitty bungalow set!!!! It's so versatile as you have shown! Love that green sparkly grass! And of course the clouds - awesome!!!! Great idea to color the clouds black. Does give a spooky look. have to remember that idea. Those clouds are spook-alicious! Great Idea! Great job with this fun Halloween card! I love everything about is, but the glitter tape grass is my favorite! Thanks so much for sharing! I'm looking forward to all you have to share this week! Super cute! Love the clouds! I'm perfectly k. with your adorablloween card... love those clouds and the cute Bungalows :).